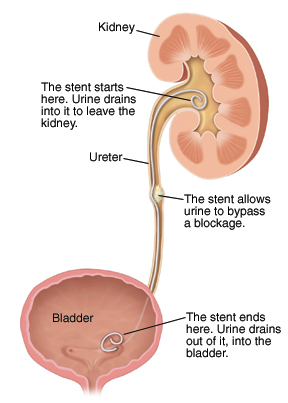 A ureteral stent is a soft plastic tube with holes in it. It’s temporarily inserted into a ureter to help drain urine into the bladder. One end goes in the kidney. The other end goes in the bladder. A coil on each end holds the stent in place. The stent can’t be seen from outside the body. It shouldn’t interfere with your normal routine. Your stent will be put in by a urologist (doctor trained in treating the urinary tract) or another specialist. The procedure is done in a hospital or surgery center. You’ll likely go home the same day. Your doctor will give you instructions to prepare for the procedure. X-rays or other imaging tests of your kidneys and ureters may be done beforehand. You receive medication to prevent pain and help you relax or sleep during the procedure. Once this takes effect, the procedure starts. Medication to control pain or bladder spasms or to prevent infection may be prescribed. Take this as directed. The stent is often taken out after the blockage in the ureter is treated or the ureter has healed. This may take 1–2 weeks, or longer. If a stent is needed for a long time, it may need to be changed every few months. Your urine contains blood clots. You have a fever over 100.4°F, chills, nausea, or vomiting. Your pain is not relieved with medication. The end of the stent comes out of the urethra.